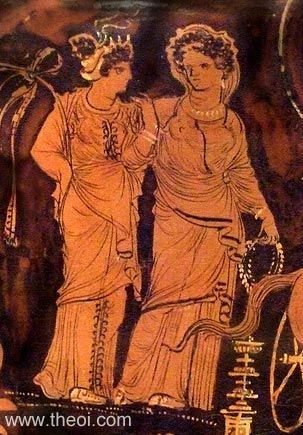 Detail of Aphrodite and her handmaiden Peitho in a painting depicting the story of the love of Endymion and Selene. Aphrodite holds a myrtle wreath and is named on the vase. Her companion is probably Peitho (Persuasion) who often appears beside the goddess in scenes of seduction.